Park In-bee ties for 3rd at Lotte Championship, failing to regain No. 1 spot. April. 16, 2018 07:40. by Heon-Jae Lee uni@donga.com. Was her ambition to regain world’s No. 1 spot too much burden on her? 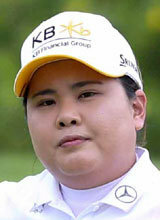 Park In-bee missed short-distance putts in succession and failed to achieve 20 career wins in the LPGA Tour. Park played the even par of 72 by posting four birdies and four bogeys in the final round of the Lotte Championship, which took place at the Ko Olina Golf Club (par 72, and 6,397 yards) in Oahu Island, Hawaii in the United States on Sunday. Park scored 7-under 281 overall to tie for third, lagging five strokes behind the winner Brooke Henderson (12-under 275) of Canada. After the third round, LPGA said in its official website that if Park In-bee wins the title, she would beat Feng Shanshan of China to rise to No. 1 in world rankings. Park last ranked first in world rankings on October 20, 2015, and thus was close to rising to No. 1 anew for the first time in two years and six months. Even if she did not win the title, she could have emerged as No. 1 if she significantly widened the gap in strokes vis-à-vis Feng. Park constantly remained as lone runner-up through the 16th hole, raising the expectation that she may reclaim the No. 1 spot in the world. However, she hardly lived up to her fame when paying the last holes of Hole 17 and Hole 18. She missed short-distance putts of about 1 meter in succession and bogeyed. After all, Park ended the competition tying for third. Feng Shanshan, who tied for third with Park, remained No. 1 in the world. However, Henderson, who appeared to be losing ground momentarily when playing a bogey at Hole 12, birdied at Hole 14 and Hole 16 to secure her win.